Add text and drag to position beside Ticket Number if required. eg: 'Ticket Number:', Seat position etc. 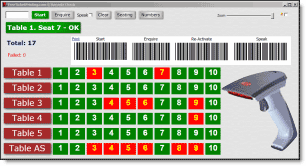 Click Number on Ticket to activate, drag to position, mouse-wheel to re-size, color selector to change color etc. Right click to rotate Vertical or Horizontal. Select Ticket starting number from the From drop-down and end ticket number from the To drop-down. 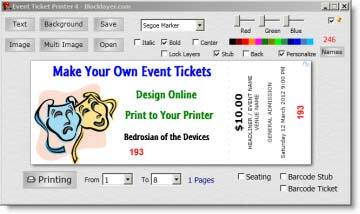 As 8 tickets are printed per page, you may need to print a few extra tickets and discard them. See Seating for Seating/Row/Table Numbers etc. The Tickets are numbered so the assembled pages, when cut, contain stacks of sequentially numbered tickets. We recommend you create a print file and then print the tickets in batches from this saved file, so make sure you include all the tickets needed. This will only create the Print File, and will not go directly to the printer.